The multifaceted nature of militant groups in northern Nigeria such as Boko Haram, as well as a lack of clear understanding of the factors that drive regional extremism, reflects larger aspects of Nigeria’s struggle for unity, a panel of scholars told the audience at a roundtable organized by the Africa Center for Strategic Studies on December 13, 2013. 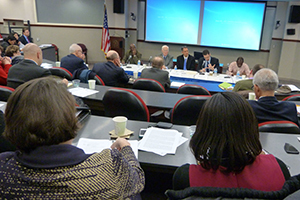 The roundtable, “Understanding and Mitigating the Drivers of Islamist Extremism in Northern Nigeria,” took place at the National Defense University. Panelists included: Dr. John Paden of George Mason University; Dr. Ousman Kobo of Ohio State University; Dr. Alex Thurston of the Council on Foreign Relations; and Mr. Michael Olufemi Sodipo of the Peace Initiative Network in Kano, Nigeria. Panelists evaluated relevant policy implications for groups like Boko Haram and identified strategies to sustainably diminish the appeal of extremist narratives more generally. 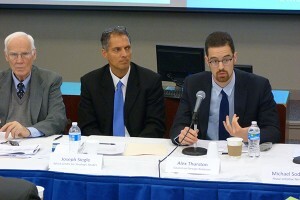 Dr. Joseph Siegle, Director of Research at ACSS, moderated the discussion, which was attended by approximately 90 participants. Dr. Paden, who opened the presentations, said a main problem in Nigeria is the lack of a national identity. “The whole challenge in Nigeria since its independence has been the struggle to create a nation,” said Dr. Paden, who has conducted research on the country for decades. He added that the presidential elections in 2011 further split the Nigerian people. While the turnout in the south was considerable—probably because President Jonathan is a Christian from the south—it was the opposite in the northern part of the country where the majority is Muslim. Furthermore, he said, the general population has been disappointed by a corrupt political apparatus, that, he said, relies solely on military responses to any type of crisis. In addition, a growing number of young people have bought into a confrontational religious identity, increasing tensions between Muslims and Christians in a sizable part of the country, Dr. Paden said. Terrorists’ actions in Nigeria are not just confined to three or four of Nigeria’s 36 states but affect about half of the federation, he said. Dr. Kobo of Ohio State University recalled the history of religion in the country, and pointed out that the politicization of religion in Nigeria dated back to 18th Century and the founding of Sokoto Caliphate by Usman Dan Fodio, whose political and social revolution—based on his religious teaching of Islam—would spread throughout what is currently northern Nigeria and northern Cameroon. However, Dr. Kobo said, the 1970s marked a pivotal moment in Nigeria’s religious history. It was around that time that the Salafi movement started building madrasas—Quranic schools—in northern Nigeria, furthering the implementation of their understanding of Islam among northern youth. He also explained that equating Boko Haram to a just a rejection of Western education is simplistic. “In fact, the rejection of the Western education that Boko Haram emphasized in its narrative—and its name: Boko Haram meaning ‘Western Education/Culture is Religiously Forbidden’ in Hausa—was in reaction to the destruction of the indigenous culture that they sought to protect,” Dr. Kobo said. He pointed out that Boko Haram’s early leaders received a “Western education.” However, he said, Boko Haram’s leader Mohamed Yusuf built a narrative on the rejection of Western education, along with other social grievances—the youth bulge, corruption of the political elite, and the widening income divide between rich and poor in the north of the country—to rally the population to Boko Haram’s cause. Yet, Dr. Kobo added, politics and religion have always been intertwined in Nigeria. Dr. Alex Thurston, International Affairs Fellow at the Council on Foreign Relations, agreed on the complexity of the situation and looked at the way forward, especially for policymakers both in Nigeria and the United States. 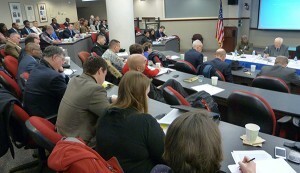 Dr. Thurston urged policymakers (from Nigeria and the United States) to avoid demonizing religious movements. Also, singling out leaders of religious-based groups like Boko Haram, he said, paves their way to martyrdom and builds an aura among their followers that is more difficult to counter. Dr. Thurston urged decision-makers to avoid a one-size-fits-all approach, especially when it comes to thinking that only force can solve the problem of militant groups. The limitations of military approaches—and the difficult question of how to break the cycle of ineffective crackdowns and inconclusive negotiations—fuels Nigerians’ disgruntlement toward their political elites. 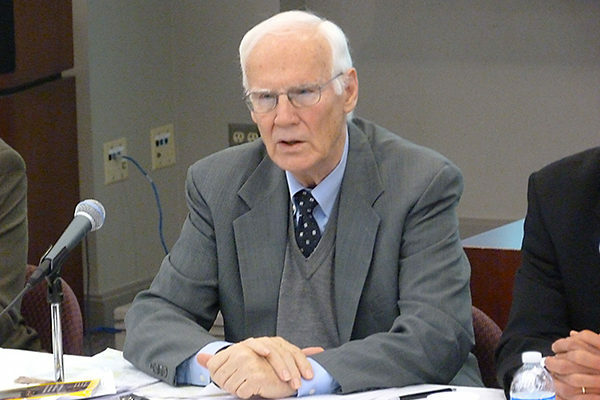 Dr. Thurston noted that the U.S. Department of State has encouraged the Nigerian government to adopt a more comprehensive approach in northern Nigeria, one that entails taking into account local grievances, to include curbing military intervention and political violence, countering the Boko Haram narrative by increasing community engagements, and increasing development programs and public investment to create jobs. “The issue of identity is one key factor to understand what is happening today in Northern Nigeria,” said Mr. Sodipo, founder of the Peace Initiative Network in Kano, Nigeria. “Rather than thinking about what you can do for–or with—them, people care most about who you are, where you come from,” said Mr. Sodipo. Mr. Sodipo said the idea of creating a peace project in northern Nigeria came to him during one of the most violent episodes of the Muslim-Christian clash in the region, during which his house was ransacked. “I saw young people with no skills and no hope, full of anger and ready to kill their neighbor because of his or her faith,” he said. That gave him the idea of creating an organization that would engrain the concept of citizenship and tolerance into Nigeria’s youth. As of today, the Peace Initiative network is committed to promote and help young people in four states—Kano, Gombe, Plateau and Delta States—to realize their full potential and role in the communities they live in, in order to foster a positive change in Nigeria. Talking about one of the bloodiest events of 2012 in Nigeria, Mr. Sodipo also said that, contrary to what was reported in the media, Muslims made up the majority of victims in the coordinated bomb attacks by Boko Haram in Kano on January 20, 2012, which left over 180 persons dead. He added that the religious and business communities in Kano were shocked by the attack. Moreover, the population was equally shocked by the brutality of security forces in response to the attack.